Description: Each case contains 16 small bowls of Coco Roos cereal. 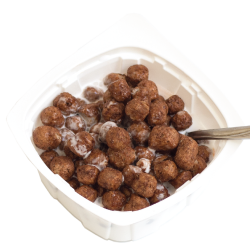 Each small bowl contains 24 grams of sweetened corn puff cereal with real cocoa. Sugar, corn flour, whole grain oat flour (includes the oat bran), corn syrup, modified corn starch, cocoa (pressed with alkali), coconut oil and/or canola oil and/or partially hydrogenated soybean oil, salt, natural and artificial flavor, wheat starch. Vitamins and Minerals: Vitamin B1 (thiamin mononitrate), vitamin B2 (riboflavin), niacin (niacinamide), vitamin B6 (pyridoxine hydrochloride), folic acid, vitamin B12, vitamin A palmitate, vitamin C (sodium ascorbate), vitamin D, reduced iron, zinc (zinc oxide), calcium carbonate. Contains wheat, soy and coconut. Also contains corn.